Broadcaster and sports journalist John Keith is widely respected in football circles. In a distinguished career, which includes more than 30 years on the staff of the Daily Express, Keith was one of a small band of sportswriters who won the trust of the backroom staff at Liverpool as the club began its Bill Shankly-powered rise to world acclaim in the 1960s. But it is Keith's long association with Bill Shankly that forever holds the real fascination for all Liverpool supporters. 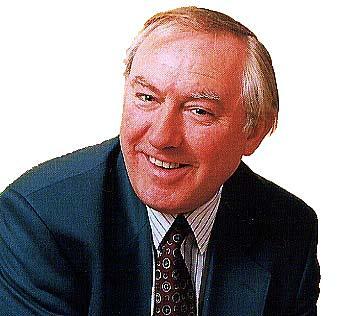 In the excellent 'Shanks For The Memory' and the audio cassette collection 'A Sporting Portrait Of Bill Shankly' John Keith has played an integral role in ensuring the Shankly phenomenon stays fresh in the minds and hearts of all football supporters, whichever team they support. His forthcoming volume, 'The Essential Shankly' will be a much valued addition to the ever growing bibliography of Shankly works. the club ), from those great days of the 1960s when music and football put the city on the map. Do you recall those early Shankly press conferences at Anfield? "I have great memories of the 1960s, the decade when Merseyside topped the charts in pop and football. I began covering the Everton and Liverpool matches in my days on the 'Bootle Times', which was when I first met Shankly, Paisley, Harry Catterick and company. The relationship between football and the media was totally different in those days from now. There was no local radio until the late 1960s, television was inconspicuous and there was a greater bond and trust between football writers and clubs. Indeed, it was the national newspaper sportswriters on Merseyside, with the backing of the clubs, who began the system of regular pre-match and post-match press conferences which are now part and parcel of football life. Even at those though, Shankly would often go off the record and talk about something that was bugging him or read out a letter he had received, which had made him laugh. One such letter came from a young Evertonian who wrote to him saying he hated Liverpool but could he have a ticket for the derby match. "I've sent him one, for his cheek," Shankly told us." You obviously formed a close and trusted relationship with Shankly during his time at Liverpool but did he ever take issue over anything you'd written or broadcast about him or one of his teams? "Shankly loved the limelight, he basked in publicity. I cannot recall having a direct row with him over anything I had written although one or two of my colleagues did. The secret was to shout back at him as loudly as he shouted at you and he would respect you for it. My late colleague Chris James, of the Daily Mirror and the Liverpool Echo did exactly that on one occasion. After Chris had left the room, Shankly broke the silence by saying: "Jesus Christ, there's a boy with a mind of his own!" Also, if you wrote a story about somebody and he didn't agree with what the subject of your story had said or done he would tell you what he thought of them, often in very colourful language." We know Shanks was a master at psychology, often trying to put one over opponents at every opportunity. Did he ever try and get the press involved with deliberately misinforming the public over tactics and team selections to his own advantage ? "Shankly's use of the press was to bolster his team and Liverpool's image, rather than to trick opponents. He was not that kind of man. Also, Liverpool's tactics under Shankly changed little, man-marking, for example, was anathema to him and you can count on one hand how many times Liverpool did that. He believed in a strong 'spine' down the middle of the team to provide defensive solidity and attacking menace and his creed was to let other teams worry about Liverpool rather than the other way round. It was only after Red Star Belgrade eliminated Liverpool from the European Cup in November 1973 that Shankly realised tactical changes had to happen, that the old Kop mantra of "attack, attack, attack" had to be modified. Yet the following summer Shankly resigned." How important is the Shankly legacy at Anfield? Is it wise to invest too much energy in looking backward all the time instead of forward? Are the achievements and successes of Shankly's era of any relevance to Liverpool FC today given that it is 27 years since he was manager there? "The legacy of Shankly is crucial to Liverpool FC. The public are steeped in the legend of Shankly, as they are in the deeds of Paisley, Dalglish and Fagan. The supporters, of which thousands are still from Merseyside despite claims to the contrary, have a celtic tendency to enjoy new success while celebrating the past. Call it a burden of history if you like, but I doubt if that will ever change. Significantly, the current manager Gerard Houllier often refers to the club's heritage and how it fires new ambitions." These days it seems that the whole Bill Shankly image is in danger of descending into some sort of caricature of itself. We have the same two or three quotes trotted out at every opportunity and the image seems to be mired in some sort of fantasy nostalgia world that never actually existed. The reality is that Shanks was actually quite a visionary in his day and very much a forward thinking manager. He also had faults and weaknesses - like any of us. He was not, as is commonly portrayed, simply a source of printable soundbites. Do you get annoyed with some of the stuff said and written about Shankly? "There is a danger that the story of Bill Shankly will descend so deep into myth it will make the tales of Robin Hood seem accurate. After-dinner speakers who never knew the man trot out alleged Shankly anecdotes which are nothing of the kind. That is why I have included a compendium of the classic, true Shankly stories in 'The Essential Shankly' to be published later this year. It is a book, I hope, which captures the REAL man, whom I was privileged to know." Irrespective of the previous two questions, Shankly's legendary status appears to be guaranteed, at least in footballing circles. We may get annoyed or frustrated at the way this legend is developing from time to time but is it not also true that this image is now so interwoven into the fabric of the club) that we may no longer be able to change public perception of the man? "It is true that the Shankly factor has run away with itself, probably never to be properly retrieved, and has overshadowed Bob Paisley, the man who rivals Sir Alex Ferguson as the most successful manager in the history of English football. However, there is no way of changing the public perception of Shankly which has become a cliche and which is fuelled by mythical stories without being balanced by Paisley stories, which are equally both inspirational and funny. I feel there should be a statue of Paisley at Anfield to accompany the Shankly statue because the lives and careers of the pair were so inextricably woven, to the massive benefit of Liverpool FC." The retirement in 1974 is still clouded in a certain mystery and, to the fans at least, has never really been satisfactorily explained. Do you accept Bill's reasoning that he was simply tired and had had enough? After all, it seems apparent that within weeks, maybe even days of the announcement, he was having second thoughts. Is it remotely possible that the pressure of his celebrity status was a contributory factor? Perhaps if he had been allowed to concentrate solely on footballing matters he may have been able to go on longer? "Shankly's resignation remains one of the great football mysteries. I feel he quit because he did feel tired and he also felt that football prevented him spending sufficient time with his wife Nessie. What he did not realise, I believe, was just how completely he was hooked on the drug called football. Within weeks I feel he regretted his decision, although he never said as much. With Bill though, it was all or nothing at all. He could not have continued as manager in some kind of scaled-down version of the role. To Bill, the job was all-consuming and perhaps he just burned out." One of the major tacticians behind Liverpool's success of the 1960s and 1970s was Bob Paisley. Could either man have achieved what he did at Anfield without the other? "When Shankly arrived at Liverpool in December 1959, and resurrected a club languishing in the doldrums, he retained the backroom staff and in the process ensured that the area of injuries, something from which Shankly shrank back, was expertly covered by Bob Paisley. Paisley was a physiotherapist of such massive renown that other sportsmen, actors, ballet dancers and pop stars would seek his diagnosis and treatment. As a former player, Paisley also had great tactical awareness and was at Shankly's side for his fifteen years in charge before taking over as manager and leading the club to undreamed of horizons. I believe that nobody could have ignited Liverpool's fire like Shankly and nobody could have fuelled it like Paisley when he became manager. In that sense they needed each other. Liverpool can thank fate for having these two men at crucial stages in the club's history. Shankly was the motivator supreme, Paisley the tactician supreme." What would we be most surprised to learn about Bill Shankly? "I was told before the game in Milan that whatever happened we would not go through to the final. I had the feeling that something was wrong politically and I believe there were some investigations later about Inter and Liverpool. We can't really prove anything but I remember being told that we would not win. It was just like a war that night. Two of the Inter goals weren't legal and I think the atmosphere affected them as well as us. I'm not saying that if the decisions on the pitch had been right we wouldn't have lost. Perhaps we would have done. But of all the people I've seen and met that referee is the one man who haunts me. But we went close to winning the European Cup at a time when no British club had won it. Celtic became the first two years later."